We are a divided nation in a world on fire, we need something to rally around. Most people would say that the world is in turmoil, on fire, whether it's man’s inhumanity to man or woman or the wrath of Mother Nature creating havoc of one sort or another. And as most of us are well aware; America is not free from the ravages of discontent, division, and civil strife. So what is it that can unite the planet, and bring about comity, manifested in a state of harmony and mutual trust and understanding among nations? Do you have an open mind, perhaps you’re a bit skeptical, and do you ridicule and laugh at the true believer? Over the years reports of Unidentified Flying Objects (UFO’s), also known as “Flying Saucers,” have gotten coverage in a number of periodicals and on rare occasion cable news. There was an incident several months back, in which a commercial pilot and his co-pilot spotted an object that moved in what was described that defied all known laws of physics. The UFO acted in an unconventional manner and achieved speeds that the commercial jet could not challenge. Photos of the object did not reveal it to be of any known man-made configuration. Throughout history, there have been reports of objects in the sky. In ancient times, as far back as 500 BC, Chinese astronomers recorded such phenomenon. Back then these strange objects were attributed to angels, agents of supernatural forces, and omens of one sort or another. Unexplained aerial sightings over time could also have been attributed to astronomical events - meteors, ball lightning, shooting stars. But there are similarities in medieval religious drawings that resemble present-day representations of UFOs. Project Blue Book (PBB) was a top-secret investigation of Unidentified Flying Objects (UFOs) conducted by the United States Air Force from 1952 to 1969. Dr. J. Allen Hynek, then a brilliant college professor was recruited by the Air Force to conduct the clandestine operation, along with Air Force Captain Michael Quinn. The project was headquartered at Wright-Patterson Air Force Base. When it was discovered that some of the encounters that were studied could not be explained as a natural phenomenon, the military decided to go no further; the incident would remain open without explanation. Dr. Hynek began to suspect that the government was perpetrating a conspiracy to cover up the truth from the public. PBB was abruptly terminated in 1969, any activities conducted under its auspices was terminated. Reported sightings in the seventeen-year history of PBB was 12,618, and although closed the UFO phenomena has lived on in countless other sightings the world over. Project Blue Book was retired to the National Archives; the contents are open for public scrutiny. Recently two commercial airline pilots, one with British Airways, the other from Virgin Airlines, reported seeing UFOs flying in a formation pattern at Mach 2 speed over the coast of Ireland. They said there were a number of objects bright in appearance and flying in formation. The Irish Aviation Authority said “they would conduct an investigation under the normal confidential occurrence process.” Stay tuned. What would a discussion on UFOs be without mentioning the Roswell Incident? In 1947 according to the United States Air Force, one of their weather balloons crashed at a ranch near Roswell New Mexico. 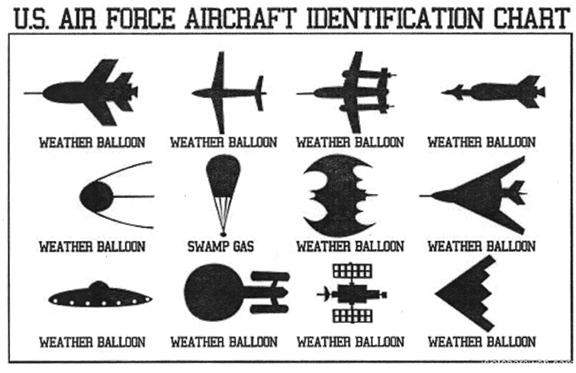 The disc-shaped object attracted interest, but the Air Force insisted it was a conventional device. Over the next 23 years, little was made of the incident, until 1970 when UFO enthusiasts began putting forth conspiracy theories that claimed an alien spacecraft had crashed-landed and extraterrestrial beings were in military custody. To this day, and after a number of documentaries and a 1994 movie “Roswell: The UFO Cover-Up,” this incident stills holds great interest; however, Roswell has been described as “the world’s most famous, most exhaustively investigated, and most thoroughly debunked UFO claim;” that’s one opinion. At the beginning of this article, I asked what we can do to unite humankind. Some matter or event that calls on each of us to come together in a mutual effort to confront what could be a threat to us all. How about this as something to consider, and I ask that you indulge my fantasy. What if an unidentified aircraft landed on the front lawn of the White House, similar to the great 1951 science fiction movie “The Day the Earth Stood Still,” with the star Michael Rennie, as an alien who visits earth to warn us that we face imminent destruction if we don’t change our violent destructive ways. thought, but now as of this writing have had your curiosity peaked, the History Channel will begin a new series on Project Blue Book on January 08, 2019, 10:00PM/9:00c - tune in, WE’RE NOT ALONE.